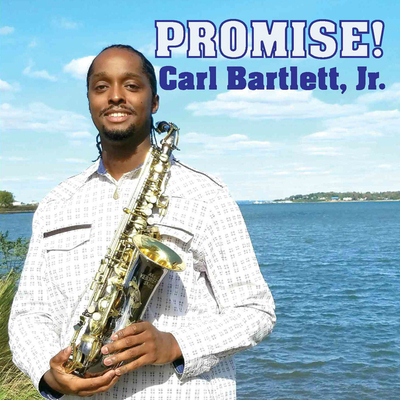 I will start the new year with a review of a CD that has been released on December 14 by Carl Bartlett , Jr., an alto saxophonist and composer from Queens, NY. The album is called “PROMISE!” and Carl has produced and released it on his own label. He describes his music as Post-Bop/ Straight-Ahead/ Contemporary Jazz, so expect something new , something you have not heard before. There are 8 songs on the album, all are original material from Carl. The CD starts with the title song “PROMISE!” and as you can expect from a title with capital letters, the song is a strong statement of what the CD and Carl’s music is all about: After an intro with saxophone and piano the head is moving between 3/4 meter and 4/4 meter and the tonal center moves from Bb to Eb, which gives the the melody a very open feeling. With the solos comes then the rhythmic variation to a halt, but harmonically the two tonal centers continue to exist. Multiple tonal centers is one of the most characteristic elements of contemporary jazz music and we see with Carl a master in composing, arranging and playing this kind of music. Also his fellow musicians convince in this song , Yoichi Uzeki on piano and Sylvia Cuenca on drums shine with their solos. The second tune, a bossa nova called “High Pizzazz” has a 5/4 meter bridge and modulates between D minor and F# minor with the tonal center as C# major. The first solo here is given to Marcus McLaurine on bass, followed by Carl on alto saxophone. Even if this harmonic structure looks complex, you can follow this song quite easily. According to Carl “High Pizzazz” is a tune where people really connect during a concert and and I am no exception here, this song is one of my favorite tunes an the album. The third song is called “Dialed In (Like A Laser)” and it starts with the saxophone mimicking a phone call followed by a furious unisono intro for piano and saxophone. The tune is a very fast swing in 11/4 meter with a interesting two bar piano vamp where the 11 beats are split into a 5-3-3 / 3-3-3-2 pattern. The best part of this song is the dialog between piano and drums followed by a great drums solo. Now it’s time for the ballad “As The Gift Unfolds Before My Eyes”. Yoichi Uzeki on piano plays a beautiful classically inspired intro. The melody has many long notes which are intoned perfectly by Carl. The first solo goes to Marcus McLaurine on bass, followed by shorter saxophone and piano solos. The next song is called “The Bartlett Family” and it features Charles Bartlett on trumpet. Charles is Carl’s uncle and he is also responsible for dragging Carl at the age of 14 into jazz music by presenting him a Brecker Brothers album on Christmas Day (to be precise it was the album Dream Suite/New York by Dreams). After the tunes in odd meters, “The Bartlett Family” sounds like traditional jazz music with it’s 4/4 medium swing and it’s almost regular form. 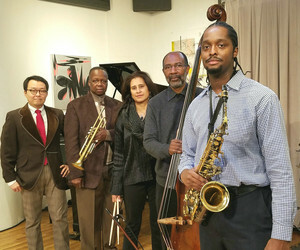 The classic hard-bop quintet cast adds to this impression. Easy to follow and easy to listen, another of my personal favorites. “Ethereal Heartbeats” starts with a very freely improvised bass intro, followed by an enchanting melody in 5/4 meter. The solos are played over an 5/4 meter medium slow bossa nova and a 4/4 double time samba. These tempo changes and how light and easy the whole band stays on time is very impressive. “Fidgety Season” is the seventh song on the CD and this song was recorded before on Carl’s first album “Hopeful”. The tune is a 3/4 medium swing with solos for piano, bass, saxophone and drums. It comes with a nice melody and very pushing pulse in the saxophone solo. Carl told me that he recorded the song again because the audience likes it so much so he wanted to give a kind of deja-vu to the listeners (another reason is the little story around this song about Carl’s students becoming fidgety in June), so here you have the official Carl Bartlett, Jr. hymn. The CD finishes with “It’s Been So Grand”, a 24-bar blues in F key in best Charlie Parker tradition, very fast and with a chromatic melody played unisono by saxophone and trumpet. The solos are either in one key (trumpet) or are alternating between the F and B key (piano, saxophone). As a summary I have to say, the CD contains outstanding material, played excellently be very experienced and sophisticated musicians that understand the material very well. The band is playing together for quite some time and you can hear that, the interplay is impressive. Charles Bartlett as guest brings extra richness in sound but also a kind of traditional approach which helps the listener to relax a little bit. The mastering and the overall sound quality is also outstanding, all instruments are clear and distinct. All songs were recorded live so when you go to a concert you can expect the same kind of mastery. Carl was so generous to send me the lead sheets to all the songs which helped me a lot to see through all the rich material that has been provided on this album. I tried to explain the structure of the songs to give you a head start when listening to the CD. Please take your time to explore new territories, it’s worth. If you want to know more about Carl, please go to his website. It has updates on shows and links to order the CD. Enjoy.